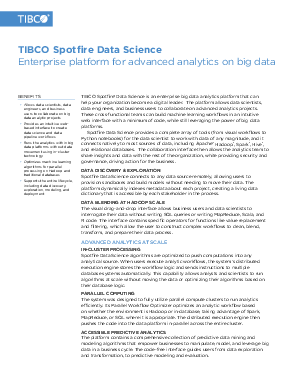 TIBCO Spotfire® Data Science is an enterprise big data analytics platform that can help your organization become a digital leader. The collaborative user-interface allows data scientists, data engineers, and business users to work together on data science projects. These cross-functional teams can build machine learning workflows in an intuitive web interface with a minimum of code, while still leveraging the power of big data platforms. Spotfire Data Science provides a complete array of tools (from visual workflows to Python notebooks) for the data scientist to work with data of any magnitude, and it connects natively to most sources of data, including Apache™ Hadoop®, Spark®, Hive®, and relational databases. While providing security and governance, the advanced analytic platform allows the analytics team to share and deploy predictive analytics and machine learning insights with the rest of the organization, white providing security and governance, driving action for the business.